2010 Schedule Last race: It's Gomes, again and again! STOCKTON - Jonathan Gomez, #22, visited Stockton 99 Speedway for the first time and managed to hold off two aggressive veteran drivers to pick up one of the biggest victories of his career. Gomez led all 130 laps of the Supermodifield Racing League's Southwest Tour race on Saturday in front of a season-high crowd of 3,617 at Stockton 99 - but that doesn't mean it was easy. Gomez, a 26-year-old competitor from Twin Falls, Idaho, had to deal with Eric Holmes of Escalon, a two-time NASCAR Camping World Series West champion and the fast qualifier on Saturday at 13.226 seconds. And in the final laps he had to hold off Jim Pettit of Seaside, a former track champion at Stockton who recovered from an early spin to challenge Gomez. Never losing his cool, and he never trailed as he won his first series event. "This was my fourth (Southwest Tour) race, and I couldn't be happier," said Gomez, who drives for Bob Strandwold of Modesto. "There were two things we wanted to do: get the good start on restarts and don't over drive it. That was the whole game plan." Gomez accomplished both goals. There were eight caution flags, but he was strong on every restart. Pettit had the best chance to get him, but first he had to work his way back through the field after an incident in the first half of the race. Pettit and Augie Vidovich were battling for second when Pettit fell back and was hit by Holmes. 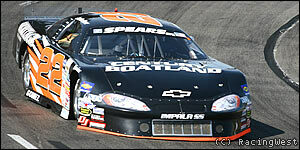 Pettit spun and was in 12th place on lap 61. "That was just a racing thing. Eric tried to make a run and took a bad angle," Pettit said. "Then I just tried to work my way up. It would have been nice to win, but this was a very good finish for us." Holmes took responsibility for hitting Pettit. He was in second place for a while, but his car's performance faded in the latter laps. "The car was great all weekend, and halfway through the race it just kind of fell off," Holmes said. "But it wasn't a bad finish at all." Holmes was third and Mike David of Modesto was fourth. Former Oakland Raiders players Fred Biletnikoff and Jeff Barnes, along with current Raiders assistant coach Mike Waufle, were the grand marshals of the race. Bomber division driver Lulu Simpson of Stockton was injured when her car hit the wall on the front straightaway hard on the second lap of the main event. She suffered back pain after the crash and was taken to St. Joseph's Medical Center, her brother, Bobby Simpson Jr., said. Robbie Knittel of Lodi won the Bomber main event, his second victory of the season, and Larry Toon of Modesto had a clean sweep in the B-4 class. Gary Glenn won the Grand American Modified race, Darren Amidon was the Legends winner and Travis Affonso won the Mini Cup event. It seems like it was just yesterday this Season began. But now, here we are, already approaching Mid-Season. Of course, this is the time of year when the Touring Series makes their rounds, which, according to many, is the best time of year because of the undeniable great racing that the Tours bring to the local circuits. So, on Saturday, June 12th, Stockton 99 Speedway Welcomed Back the Spears SRL Southwest Tour Series in the Mid-Valley Iron & Metals 130. Also on the ticket for the evening were the Grand American Modifieds, Legends of the Pacific, Basically-4-Cylinders, Bombers, and Mini Cups. This Series never fails to amaze, and as the SPEARS SRL Southwest Tour hit the speedy asphalt surface for their one and only visit of the 2010 Season, the thick air of enthusiasm from the 3600+ in attendance couldn’t be cut with a hot, razor-sharp knife. With all the pre-race hoopla building to this night, these boys had a lot to live-up to. But not to worry, the talent and tenacity absorbed by this Series always manages to quench the thirst of even the staunchest race critic. Due to a six-car invert, Jonathan Gomez (22) of Twin Falls, Idaho, inherited the pole with M.K. Kanke (33) of Frazier Park, to his outside. As the green flag fell, Gomez took full advantage of his starting position as he grabbed a huge hunk of forward bite and was gone with the wind. However, on lap 4, the wind was briefly taken from his sails when Ross Strmiska (90) of Manteca made contact with Derek Thorn (2) of Bakersfield, who in turn made contact with Kanke in turn two, which brought out the first yellow of the race and relegated Strmiska to the tail-end of the longest line for his part in the mishap. On the lap 7 restart, Gomez got a fantastic jump on the field and off he went again until lap 27 when Steve Belletto (30) of Modesto went spinning down the front-stretch which caught the immediate attention of the flagman who then sent the yellow flying for the second time on the night. On the lap 30 restart, Gomez once again got a large jump on the field, but not without Auggie Vidovich (1) of Lakeside nibbling at his back bumper for the next few laps until Gomez stretched it out a bit. Unfortunately, on lap 47, Clay Wattenbarger (77) of Bakersfield performed a solo spin going off into three which brought with it the third caution of the race. Gomez continued with the great restarts as the race went back to green on lap 50 where, at that point, it seemed his race to lose as he had shown great strength all night long. However, the race was slowed for the fourth time on lap 61 when Eric Holmes (18) of Escalon and Jim Pettit II (03) of Prunedale were battling hard over the same turf going into turn one with Pettit coming out on the losing end which relegated him to the back of the pack. On the lap 64 restart and several thereafter, Gomez owned that precious number one slot out front with the confidence of a seasoned veteran as he guarded his position, staving off all challengers until the checkers went flying above him as he laid claim to the spoils of Victory by winning his first-ever SRL Event. "This was my fourth (Southwest Tour) race, and I couldn't be happier," said Gomez, who drives for Bob Strandwold of Modesto. "There were two things we wanted to do: get the good start on restarts and don't over drive it. That was the whole game plan." Pettit, after his earlier altercation, worked his way patiently back through the field until he got to the back bumper of Gomez where he mounted a serious challenge until he got loose coming out of turn four and slapped the wall beneath the flagstand. The car was never the same after that and he had to settle for second. Holmes rode in a solid third most of the night and that’s where he would finish. Mike David (3) of Modesto came from deep on the starting grid to pull off an astonishing fourth place finish with Brennan Newberry (29) of Bakersfield coming from even deeper to finish fifth. 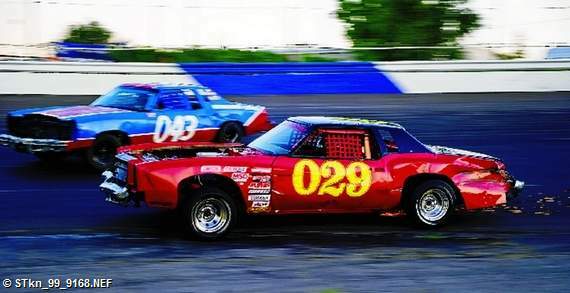 The Grand American Modifieds were back in action after a week off. And, if the car-count would continue to build, the racing would keep getting better and better. Unfortunately, only five cars showed, but that didn’t deter these drivers from racing as hard as they could. The #98 of first-timer Ryan Stepps nabbed the pole in this one due to the invert with Kyle Dickerson (14) of Manteca flanking him to the right. Stepps jumped to the immediate lead, but just as immediate, the yellow went flying on lap 1 when Dickerson and Stockton’s Leroy Hunt (63), in his first appearance at the Speedway this year, tangled coming up off turn two, which brought an immediate end to both driver’s night. After the cars were removed and the track was cleaned, this one got back underway with Larry Tankersley (96) of Stockton driving to the point with field in tow until lap 5 when Gary Glenn of Orangevale edged him (Tankersley) out, ever so slightly, at the line for the lead. From that point forward, Glenn was unstoppable, and was never challenged as he crossed beneath the flagstand for his third win of the year at Stockton. Tankersley fell off the pace a bit, but still managed a distant second with Stepps bringing her home in third, which was an amazing feat in itself, since this was his first time in a race car. It seems as though lately, when the Tour is in town, the Legends of the Pacific are sure to be close at hand. And so it was on this night as the Legends hit the high-banks to do the special thing they do: absolutely great racing! Stanislov Osterlund (42) of Los Gatos and Cody Berger (63) of Tracy brought the field around to greet the green to get this one up to speed. The seventeen-year old Osterlund showed his dominance early on as he held strong to the lead for the first fifteen circuits, but on lap 16, from P9 on the starting grid and working his way methodically through the field, Darren Amidon (03), took possession of the real estate out front where he would remain until the checkers went flying above him as he crossed the finish line for the very convincing win. “It’s great to come out here and win against a field this strong,” Amidon said, “I want to thank everyone involved in making this happen.” Donny Darter (99) of Manteca, and a long-time fan-favorite, pulled to within a half car-length at the stripe, but fell just short and had to settle for second. Tracy’s Jeremy Wood, a great racer in his own right, came home on the podium in third with Cale Kanke (33) of Frazier Park, and son to SRL Great M.K. Kanke, finishing in the number four slot. The #89 of Tony Green rounded out the top five. For a multitude of fans in the stands, it was great to see one of the all-time great Street Stock Drivers, Danny Guibor, back in action on his old stomping grounds. The Basically-4-Cylinders were back to the track to showcase their best as they always do. Larry Toon (88) of Modesto got this one underway from P1 on the grid with third generation and fourteen-year old rookie driver Matt Anderson (5) of Manteca at his side. Toon got the holeshot going off into turn one and once out front, he would go not virtually, but actually, unmolested to the finish line for the flag to flag victory, almost a half lap ahead of his nearest competitor. “This never gets old,” said the very pleasant Modesto driver, “It’s getting harder and harder to win one of these things with the competition out here.” Modesto’s JD Silva (56), after battling it out with several drivers, won out to control second place as he crossed the stripe behind Toon. Points Leader Richard Hull (23) of Modesto, by virtue of his third place finish, held on to his lead over Silva by a mere one point. The #61 of Kelli Bobbitt, Fairbanks, Alaska, finished a very consistent fourth with Dan Durbin (13) of Modesto rounding out the top five. The beatem bangem Bombers rolled onto the Little Jewel of the West to get their much-anticipated race underway. Each week they show up, the car-count grows and the racing gets tighter. The growth would continue on this night with one of the best races the Division has produced to date. Second generation driver Robbie Knittel (3) of Lodi shared the front row with first-time driver Matt Wendt (2), also of Lodi. As the green flag flew, Wendt jumped out to the early lead only to be slowed on lap 2 when LuLu Simpson (888) of Stockton lost it coming out of four down the front-stretch and hit the wall head-on just below the flagstand bringing with her first the yellow, then the red. Simpson was transported by Ambulance to St. Joseph Medical Center after complaining of back pain. At the time of this release, no other details were available. On the lap 3 restart, Wendt assumed his spot on point where he held strong until lap 11 when Knittel powered by for the lead. Once out front, despite two more cautions, and Wendt gnawing at his back bumper, Knittel would not be denied on this night as he crossed beneath the checkers ahead of the rest of the field for his second career win, and second win on the year. “This feels really great to win another one,” said the always polite sixteen-year old, “I would like to thank everyone who helps us make it out here every week.” Surprisingly enough, and most impressively, the twenty-one-year old Wendt held on to finish second in his racing debut. Stockton’s own Tom Dahl (004) worked his way up from shotgun on the grid to finish an absolutely fantastic third. 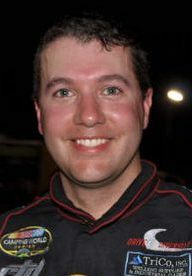 Points Leader Travis Tucker (350), also of Stockton, managed yet another top five finishing fourth, followed closely to the line by The Ben Lewis (020), who finished fifth. In the Mini Cup Division, so far the car-count has been much less than expected this year. But the hopes are things will pick up because these little guys really do put on a great show. Points Leader, and undefeated so far this Season, Travis Affonso (11) started on pole with the #48 of Jared Cronk alongside. Affonso took the green along with the lead as he has so many times this year. And it looked like another sweep on the night, however on lap 11, the #57 of Landon Reynolds spun coming out of turn two and Affonso went high to try to avoid him, but to no avail. Affonso got pinched into the turn two wall, which unfortunately ended his night and his win-streak at three. After a lengthy caution, the green went flying once again, and this time it was all Cronk as he sped away to the checkers for his first win at the Speedway. Reynolds would finish second with Affonso rounding out the top three. Next Saturday, June 19th, the NASCAR Whelen All American Racing Series Western Late Models and Street Stocks will be back in action. Also, for the open-wheel enthusiasts in the crowd, the NCMA Sprint Cars, USAC Focus Midgets and Jr Focus Midgets will be on hand to produce the kind of racing magic only they can perform. And, last but not least, the Enduros will be back for 199 Laps of wet and slippery excitement to please every fan in the stands. Also, everyone needs to mark their calendars for Saturday, July 10th, when Stockton 99 Speedway Presents Bo Bice Live In Concert with Special Guests Stone Corral and Last Stage. Gates open at 2 PM with the show starting at 6 PM. Concert goers and Race enthusiasts alike will definitely enjoy this Ground Breaking Event.